The Half Black Angelfish isn’t as colorful as some of its dwarf angelfish counterparts, but it still makes a great addition to a FOWLR aquarium. It isn’t as aggressive as other dwarf angels and is hardy. As with all dwarf angelfish they may fight with conspecifics and other fish of similar shape and color. This omnivore needs plenty of hiding places and mature live rock with algae for grazing. The Half Black Angelfish is known for nipping at certain types of coral, especially SPS corals and Zoanthids. Some call the Half Black Angelfish the “Jekyll and Hyde” of all dwarf angels. Model citizens can turn all of a sudden into boisterous tank hooligans. Underfed individuals are more prone to nipping. Feed 2-3 times a day with a varied diet consisting of frozen food such as Mysis Shrimp, enriched Brine Shrimp, seaweed sheets, Spirulina, etc. Although dwarf Angelfish have a reputation for fighting with each other, interestingly enough the Half Black Angelfish also cross breeds. It often cross breeds with the Lemon Peel Angelfish as well as Eibl’s Angelfish. This naturally creates a wide variety of color combinations. Overall, this species is desirable due to its contrasting colors, small size and interesting personality. 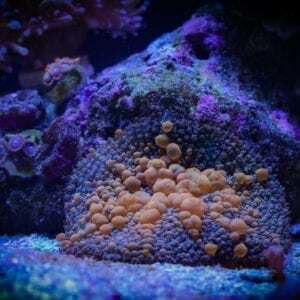 Although not recommended for a reef tank, they make an excellent addition to a moderately peaceful FOWLR tank.